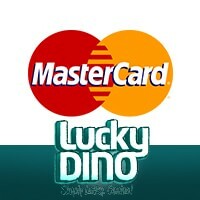 LuckyDino Casino MasterCard—where your luck begins! Who doesn’t know about MasterCard? If you’re an online shopper or an online gamer, it’s inevitable to come across this reputable establishment. A well-known financial brand even beyond the World Wide Web, people prefer transacting with MasterCard for a reason. Hence, it’s also the reason why the LuckyDino Casino MasterCard is a prevalent payment method in this casino! Considering it’s a trusted brand worldwide, you know security is the least of your concerns. You will also feel secure whenever you make a transaction because you know all your previous business with MasterCard has been a-ok, and the same goes for your experience with LuckyDino Casino. To add to that, it’s a fact that this casino runs on SSL or Secure Socket Layer encryption technology. Rest assured all your info is 100% safe! If you want to begin a real online casino journey, the only way to start is by making your first real deposit. For as low as €25, and as much as €5000, you can instantly credit the amount to your casino account. Other than the instant processing time, there is also no processing fee to be paid. Compared to the deposit method, a MasterCard withdrawal’s processing time will take longer than usual. It takes 1-5 banking days to process, and a fee might be added after the first free withdrawal of the month. The fee entails a minimum of €2.5-€25 max at 3%. Even though the withdrawal time takes a while to process, there’s no dispute about it that this casino will make it worth the wait. If you’re aiming for a worry-free banking experience, you just know MasterCard is the way to go. Let your luck begin! Sign up now and make your first deposit via LuckyDino MasterCard!